Upon hearing I was going to have the privilege of having some valuable one-on-one time with one of Canada's best known chefs prior to our 'FireWorks Feast' experience, I was feeling a tad nervous. 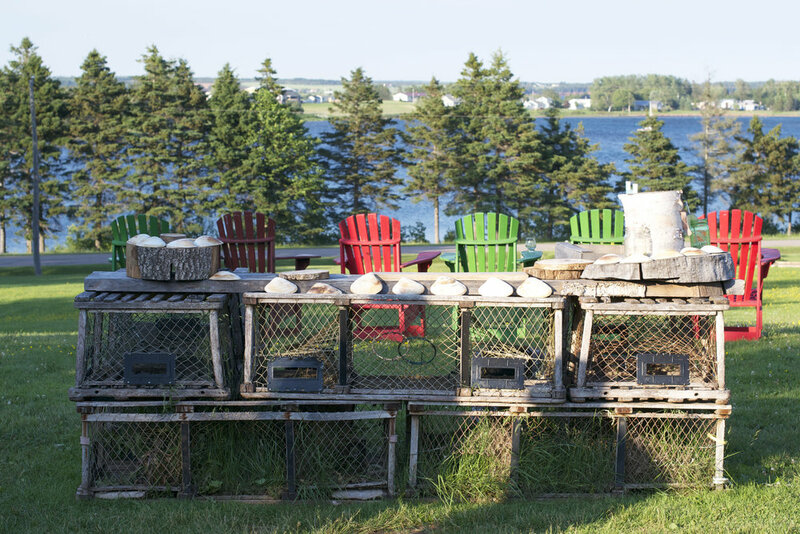 I read as much as I could on Chef Michael and the Inn at Bay Fortune to prepare. However, in the end, I went with my gut and chose to have an informal chat with him versus a scripted Q & A. What I discovered was a kind, down-to-earth, intelligent man with a passion for healthy living, organic farming, regionalism and sustainability. Michael has a clear vision & desire to learn from the past and to look to the future. He is progressive while being thoughtfully reflective with practices and processes re-imagining the very best ways to innovatively farm organically, cook with the challenge of live fires, flavour creatively and provide an imaginative shared communal dining experience all in an environmentally conscious way for his guests. He could work anywhere in the world, but luckily for us, he chose here. Chef Michael's website tells it all, and that's half the reason I didn't get into an interview mode but instead I just enjoyed listening to him share his core values and beliefs, as well as his passion and joy for preparing, cooking and sharing flavourful food (oh, did I mention he sounds just like Jeff Bridges too). Seriously though, I was truly captivated in hearing why he and his wife Chastity chose to live here with their children and purchase & relaunch the Inn's offerings with 'FireWorks' ~ the extraordinary dining 'feast' experience that we came for. 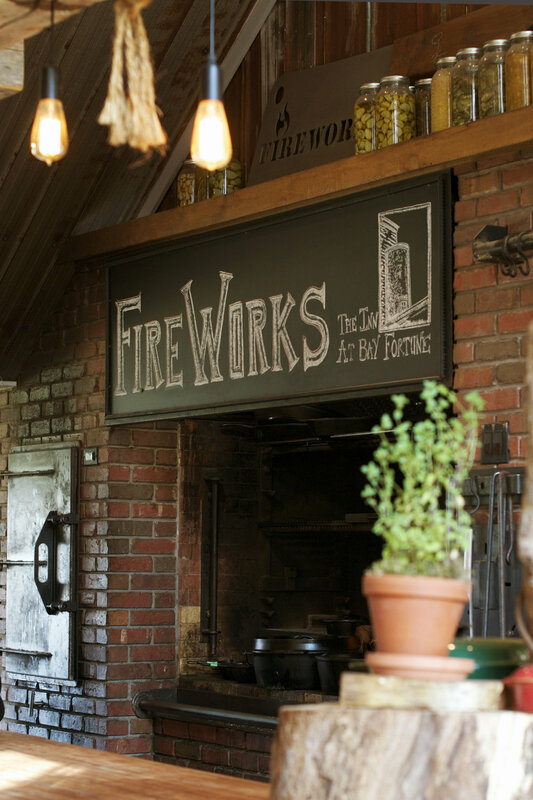 'FireWorks' is also the restaurant's name and most notably the beloved brick-lined, wood-burning, 'fire-breathing beast' Chef Michael & his Fire Brigade (his team of chefs) proudly practice the ancient art of live-fire cooking in. Preparing & presenting food from flame and sharing it with others has been a deep fire that has burned in Michael for years and now he and the Fire Brigade prepare 100% of their feast offerings with live fires. We are so fortunate that they do. There's nothing like it! Chef Michael loves it here. It's that simple and that complex. This 'farm to fire to fork' dining experience could try to be replicated elsewhere in the world, but it wouldn't be the same. There's just something special about this place. About this island, this ocean, these people. This is home. Michael's chef roots are here and his wife Chastity is a proud Maritimes-born girl. What better place to raise their children than Prince Edward Island, in the heart of the Maritimes. I get it. We're Here. Let the Festivities Begin! 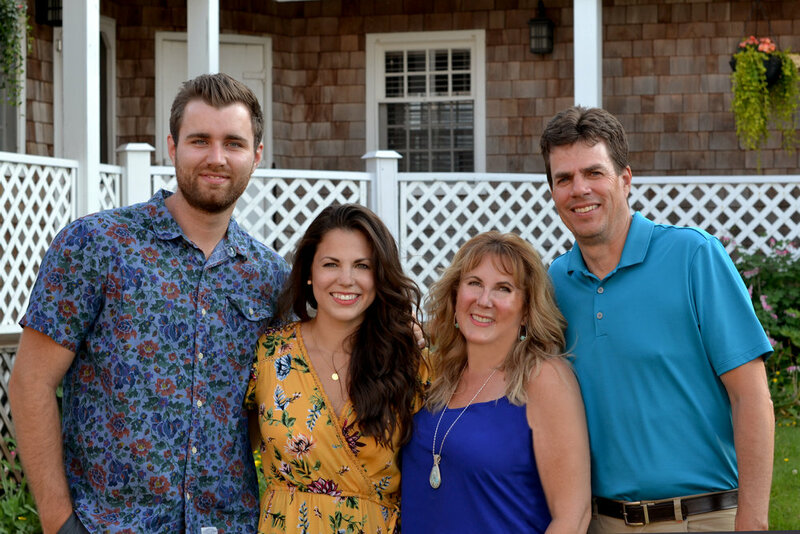 Our group of nine, two families vacationing on Prince Edward Island, were here on this day at The Inn of Bay Fortune all because my daughter Lauren and her boyfriend Brandon met 5 years ago at Ryerson University in Toronto. Our families became fast friends and decided a joint vacay was in order. So after confirming cottage rentals together several months ago, Brandon's mom Colleen suggested we also take in Chef Michael's 'FireWorks' experience. So here we were. Foodies all and excited beyond belief for this special evening, settled in the comfy lounge with cocktails and sharing highly anticipated conversation about what our evening might hold. At 5 o'clock... 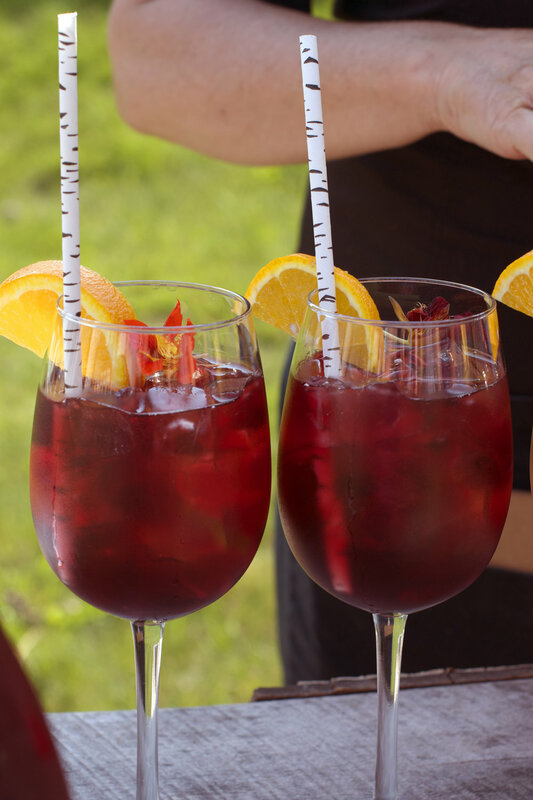 I swear I heard a Sangria calling my name, so we wandered outside (others heard the call too but for some they heard a 'signature caesar' beckoning). 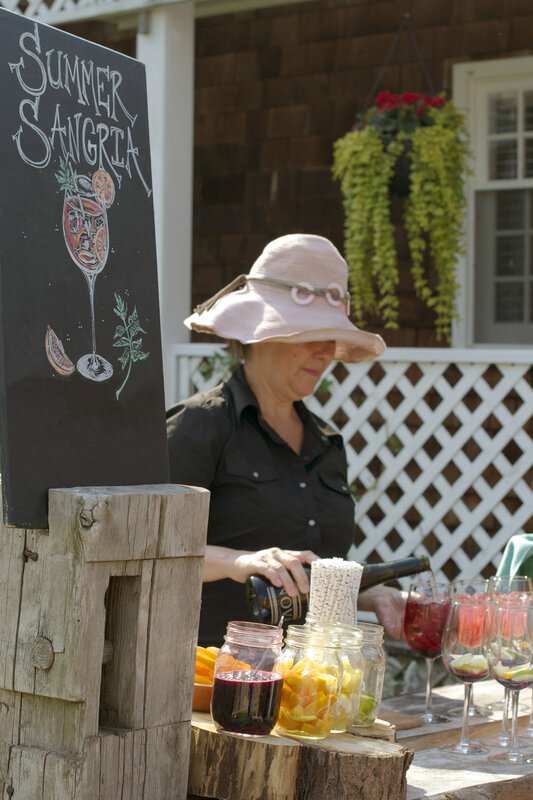 Guests were signing in and milling around the extensive grounds and just like that ~ it was wine o'clock! For those that preferred other libations, no worries ~ there were lots of options to chose from. Even those not staying at the Inn that were designated drivers enjoyed an iced tea or a choice of naturally flavoured water blends in fancy water dispensers inside. Chef Michael suddenly appeared, began mingling and the evening was afoot. Chef Michael gave the informative walking tour of the whole farm and it was impressive. The connectivity the chefs have to the land, water and animals here is impressive. As described on the Inn's Farm/Fires/Feast handout... "We chop wood. 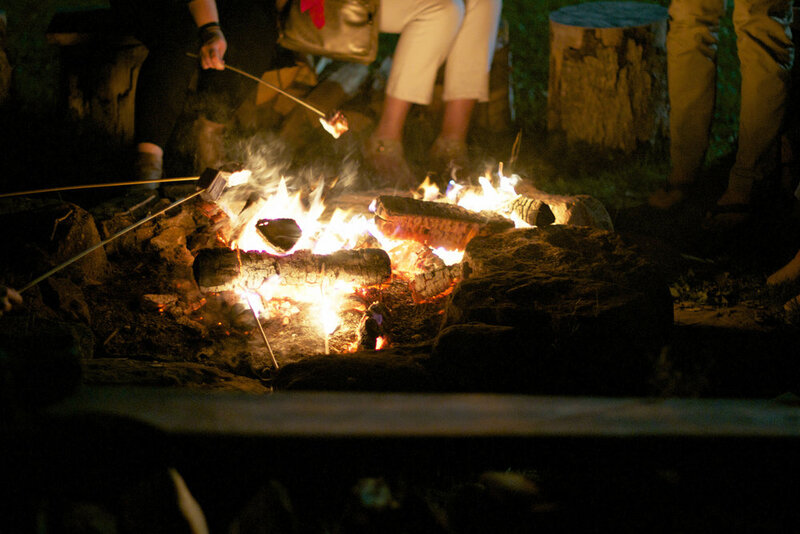 We build fires. We forage. We farm. We fish. We ferment. We grow vegetables. We raise pigs. We cook. We bake. We smoke. We pickle and preserve. We serve and share. We are the Fire Brigade." In a nutshell, they do it all. These cooks are hands-on every step of the way. They also become masters of studying live fire cooking techniques. Their job requires them to be physically and mentally fully present and in the moment as they work authentically throughout the day bringing the feast we all enjoy from farm to fire to fork. It's truly a masterpiece every single night when you sit back and take the time to appreciate the steps and processes that brought each course to the table throughout the evening's feast. All for you to savour every morsel of that 'just right' flavour intensity. And that Chef Michaelangelo, the mastermind behind it all. I mean really... he already had me at 'hello'. Enjoy the experience through my photographs. It was a night I shall not soon forget. Thank you Michael. This Maritimer, has only one regret... that I didn't get a personally signed copy or two of your cookbooks. Oh well, perhaps I just might have to return... Save me a spot at the table. I'll be there at wine o'clock. Welcome to Prince Edward Island's only 5 Star Inn that is well on its way to being one of the world’s leading culinary tourism destinations.